A WOMAN has died in an early morning house fire in Edinburgh after leaping 15ft out of window while engulfed in flames. Shocked locals tried to put out the flames on her body by dousing her in water and keeping her alive until paramedics arrived. It was understood she had only recently moved into the upper mid terraced villa in Fernieside Avenue with her boyfriend. He was only saved after heroic neighbours were able to smash down the front door of the house using hammers. Both were rushed to the Royal Infirmary of Edinburgh for treatment to burns and from the effects of severe smoke inhalation. However it was announced later that she had succumbed to her injuries. Her boyfriend, named locally as Norrie Gosman, 40, was still in hospital last night. He was said to have lived in the area for around four years. His girlfriend’s name had not been released. One hero neighbour, who refused to be named, told how he and a friend heard his shouts for help while trying to break down the front door after fire told hold around 2.45am. He said: “My son heard the bang and there was something burning on the ground. “At first we thought it was a cushion on fire, but it was the girl. “The guy next next door went and got water and poured it on top of the woman because she was still alight. “I went to help the next door neighbour smash the door open. “We heard him on the other side of the door. “I had a sledgehammer and that even broke trying to get the door open. “Eventually we managed to get the door open and the man out. “He was walking when he came out. “He was coughing and he had a burst lip. “Everyone was trying to help. Neighbour Tracey Fallon, 46, said: “I went out to see what the banging was and when I looked out my window all of the flames were coming out the window. “The girl had already jumped out and was on fire. She was unconscious underneath the window. “She was quite badly burnt and the neighbour had to put the flames out on her. “The guy who lives there has stayed here for about three or four years. “I think it was his girlfriend who was hurt. “He was stuck in the house and the next door neighbour was trying to get him out. “Eventually they got the hammer and got the door open and got him out. Ms Fallon said that the rescue effort was hindered due to access to the street. She claimed: “The only problem was the emergency services had problems getting into the street because of the cars. Another neighbour, John Thornton, said: “I heard the bangs. The boy underneath tried to smash the door in. “The house was well ablaze at that time. Charles Robertson, 61, said: “The fire brigade were up and down the street, hoses everywhere, ambulances and police cars. “I went out and spoke to one of the firemen. “I never saw the fire but I seen the ladders up. “The firemen were trying to spray water in. Lothian and Borders Fire and Rescue Service had a team of around 30 fire fighters at the scene. Eight of them in breathing apparatus used high power water jets and a ladder to puit out the inferno. Afterwards the blackened shell of the upstairs could be seen from street level where mounds of incinerated furniture and personal belongings had been cleared out while investigations began into the cause. A spokeswoman said: “One female had jumped from the property prior to our arrival and a man, aged 40 years, had been assisted to safety by neighbours. “Both casualties were taken to hospital by ambulance and were reported to be in a serious condition. David Lockhart, group manager, Lothian and Borders Fire and Rescue Service, said: “At about 2:45am our fire control room received the first of several 999 calls reporting a fire at 39 Fernieside Avenue. “Fire crews from Liberton and surrounding stations were dispatched to attend this incident and were faced with a well developed fire in the first floor area with a lot of flame and smoke coming from the first floor window. “At that point already a female occupant had jumped from the first floor and was found outside the building. “A male occupant had been assisted by local residents to get out the flat. 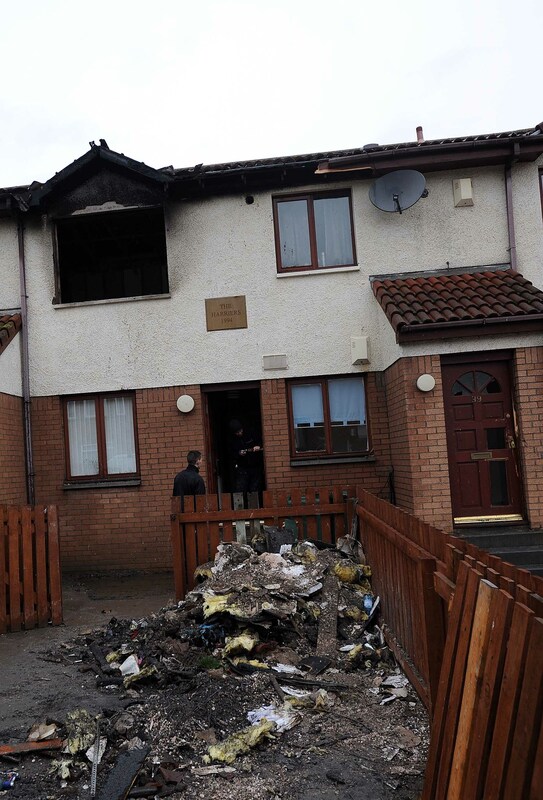 “Fire crews assisted with the Scottish Ambulance Service to treat these casualties on the scene and then they were removed to hospital and they continued to make sure there was no-one else in the building and to check the adjoining properties. “There was approximately 30 firefighters involved in the incident this morning due to the nature of the fire. “The firefighters that arrived here had really quite a hard job on their hands to start with due to the fact that there were casualties who were quite seriously injured by the fire and also the fire was large in nature and continuing to burn. 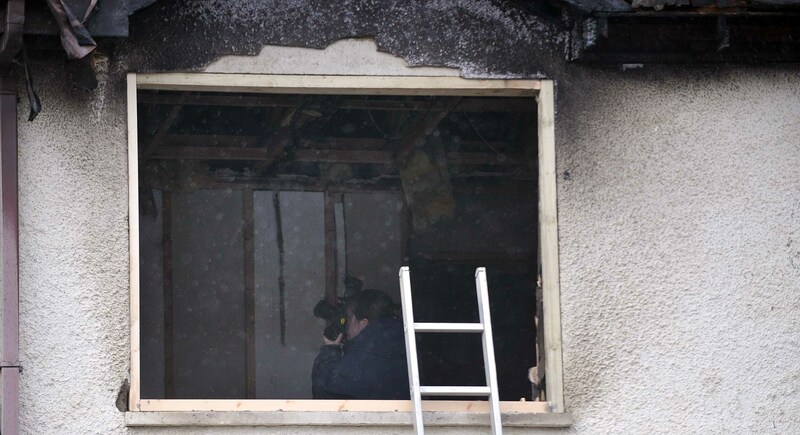 “At the minute investigations are still ongoing into the cause of the fire. However, it would appear that it started in the bedroom area. 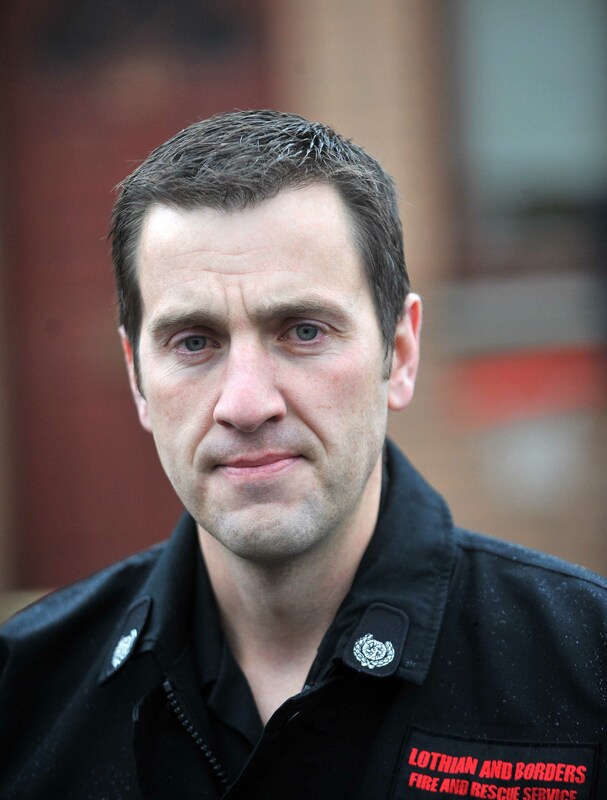 A police spokesman said: “Lothian and Borders Police are currently working alongside colleagues at the fire service to determine the circumstances surrounding this tragic incident. Last financial year Lothian and Borders suffered seven fatal fires. So far this year since April there have been four as the brigade continues to push it safer home message.